Looking for vegan cupcakes? You’re in the right place. 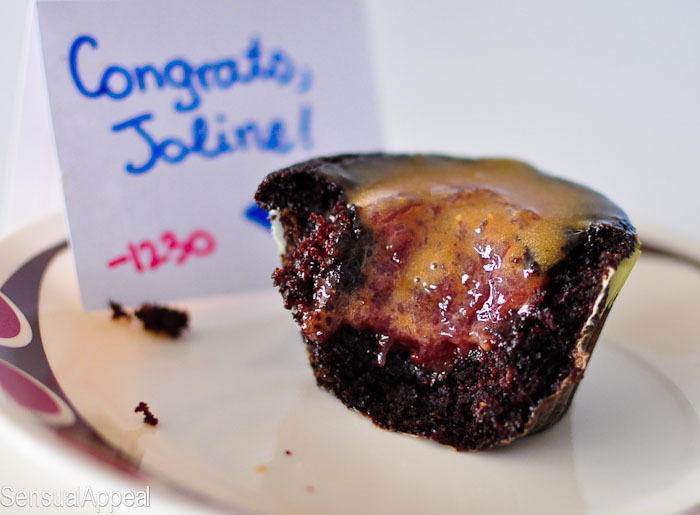 These Chocolate PB&J Cupcakes are just fabulous. 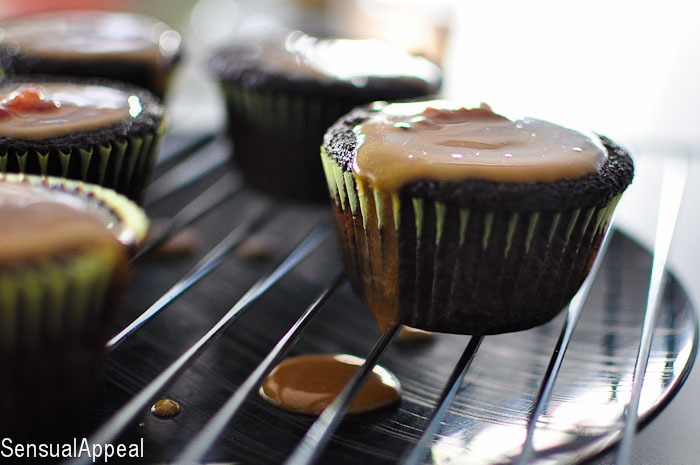 This healthy vegan cupcake recipe is perfect for vegans and non-vegans alike. Everyone loves PB&J.. especially when combined with chocolate. Yum! My roommate is graduating and moving out! So sad 🙁 Although I’ve only known her for a semester, I know I’m going to miss her so much. She was a great roommate and an awesome friend – we all hung out together all the time and had a blast. I noticed that she is all about PB&J sandwiches. She eats them basically everyday. So I thought, why not make her cupcakes? I’m looking for opportunities to bake for others so I can get rid of all of the AP flour and granulated processed sugar I have. I don’t want to use it for myself since I’ve shifted toward more wholesome and cleaner foods. So this was a perfect opportunity. I’ll make her PB&J cupcakes! 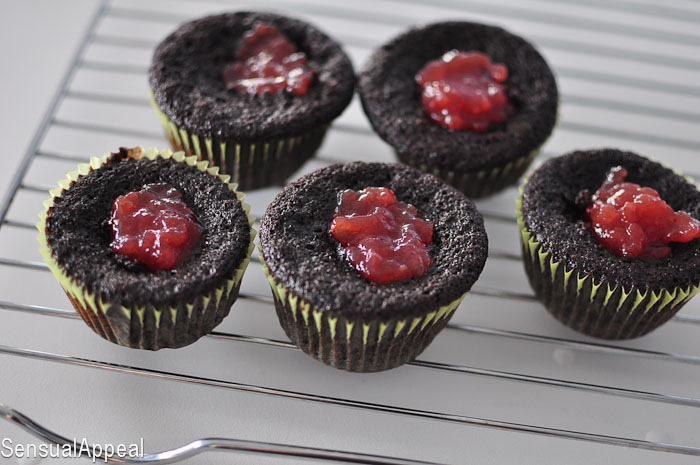 This cupcake recipe are actually, accidentally, vegan! My first time making vegan cupcakes and they turned out much different than I expected. The texture was different from a regular cupcake but none of the flavor was sacrificed. 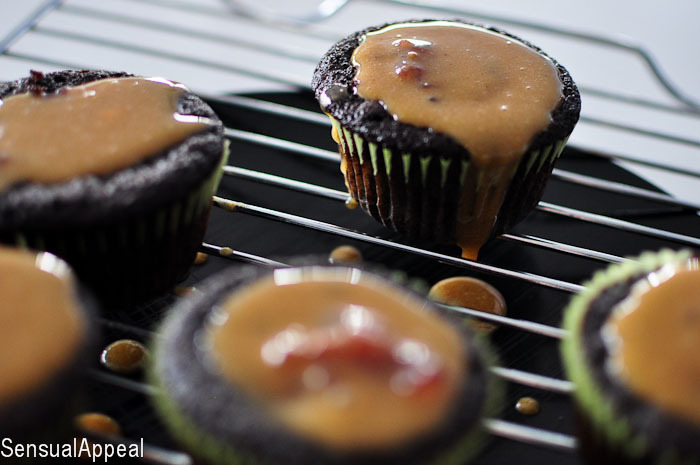 The cupcake is a perfect combination of PB&J flavors along with deep chocolate. The cupcake part is much more moist and soft than I expected but that makes this dessert taste even more sinful – delicious delight. Good thing I didn’t make a lot cause otherwise I would definitely have had more than one. I love this healthy vegan cupcake recipe! CONGRATULATIONS to my gorgeous roommate, Joline! She will knock em dead in DC! I know it. Mix the dry cupcake ingredients together. Then add the wet ingredients. Mix well. Spray cupcake liners with oil and fill up 6 cupcake liners in a tin 3/4 of the way up. Bake for 20-25 minutes. Let cool. Carve out the middle with a knife and get it out a spoon. Be careful not to go all the way down, go only about halfway down. Fill the cupcakes with jelly. In a separate bowl, add PB2 and almond milk together and mix well with a spoon. Begin adding confectioners sugar, by 1/8 cups until it reaches a creamier consistency. Taste to make sure you like the flavor. Add more PB2 to make it more peanutty. 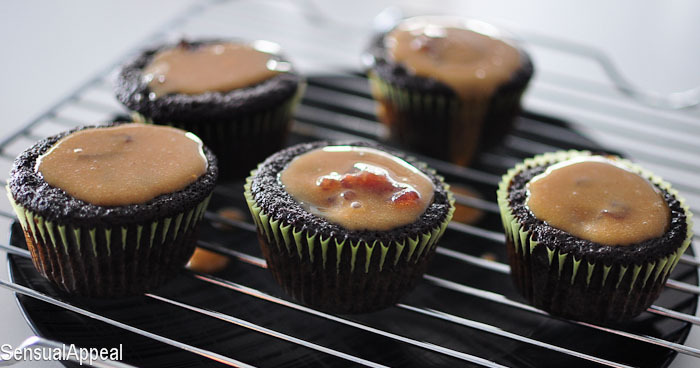 Use a spoon to spread some of the icing on the cupcakes. Stick in the fridge for at least an hour to let the icing set in a bit before eating. PS. The photo of the cupcake bitten into is taken only after the cupcake being in the fridge for 15 minutes. What’s your favorite flavor of jelly for a PB&J? What’s your least favorite flavor of jelly for a PB&J? Your cupcakes look wonderful!! I love PB&J anything! 🙂 Congrats to your room mate, but I’m sorry your going to miss her. So sorry your friend is leaving, you’ll get by though. These cupcakes look absolutely wonderful. Great looking cupcakes – my how creative! They look delicious! These sound absolutely incredible! I want to go buy some peanut flour just so I can make them! The fruity filling makes them look so pretty. Dee-lish! I’m with your roomie: give me PB&J any time! Ahhhhhhhhhhh! That is me screaming at the sight of these. They look incredible. gorgeous cupcakes! all that ooey gooeyness! I am having a fundraiser auction on my blog for vspca. Please do drop by if you have a minute! Those cupcakes look amazing. I used the PB2 to make a similar glaze on a cake a few weeks ago! Isn’t it great? Glad you like!